Many years ago, I had the privilege of working for a political maven whom many people considered certifiably insane. Probably, rightly so. Most, however, also considered him a political genius. Definitely, rightly so. Among the most important lessons I learned from him was that in the political arena, the extremes determine the middle. All of which explains, in a nutshell, why we conservatives are almost invariably losing almost every battle in which we are now engaged. The enemy brings a gun – and we pull out a peashooter. The enemy gets nasty – and we make nice. Simply put, all too often, in the misguided pursuit of civil discourse, we have become a nation of conservative cowards. Since the catastrophic Roe v Wade decision in 1972, more than 50 million babies have been killed in America’s abortion chambers (yes, “chambers” – we need to stop allowing the left to term them “clinics”). And we still slaughter nearly one million babies a year. All because the left came up with a contrived “right to privacy” neither embodied nor contemplated in our Constitution. Since then, we have gone from a day and age when even abortion proponents like Bill Clinton admitted that the ghastly procedure should be “legal, but rare” to a time when strident pro-abortionists like Michelle Wolfe “salute” abortion and the despicable website shoutyourabortion.com proudly waves the baby-killing banner. 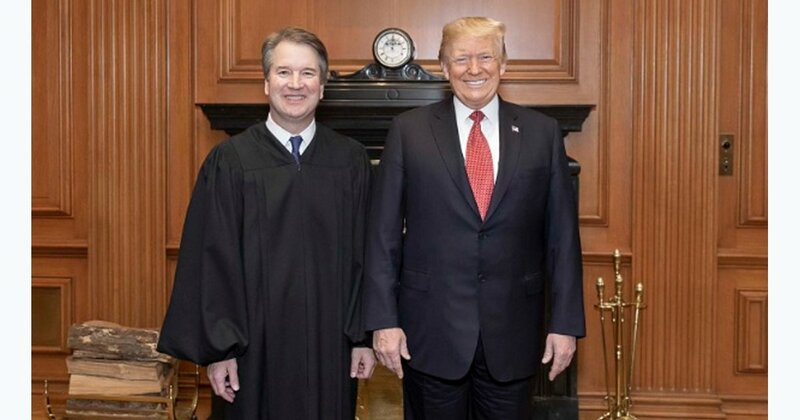 To make matters worse, we have allowed the left to make swearing allegiance to abortion the absolute litmus test for being confirmed to the Supreme Court of the United States. Only baby killers need apply, Schumer, Pelosi, and their fellow Democrats (as well as some Vichy Republicans) tell us. And if you do happen to be pro-life, you are to meekly acquiesce to the continued slaughter of the innocents because, after all, it is “stare decisis,” or “settled law” in laymen’s terms — something liberals only talk about when it benefits their side. Precedent has its benefits, but frankly, there are times when stare decisis should have good, decent conservatives storming the corrupted corridors of Congress, particularly when the far left uses it to stifle even the most tepid dissent. And they have successfully shifted the middle by imposing that extreme – despite every real historical precedent to the contrary. After the Supreme Court’s Plessy v Ferguson ruling in 1896, “separate but equal” was also stare decisis – until the Supreme Court rightly reversed in Brown v Board of Education. The unconstitutionality of the Legal Tender Act was stare decisis in 1869 – until the Supreme Court overruled its own decision in 1871. In 1941, the High Court scrapped stare decisis when it reversed its own child labor ruling from two decades earlier. In fact, the Supreme Court has overturned its own decisions dozens and dozens of times dating all the way back to 1810. And it is only in the case of the abomination of abortion that our own cowardly acquiescence to the radical left’s bogus concept of stare decisis has become the prerequisite for determining who rules on the laws of our land. That is a sham, and a shame. So, how did it happen? How did we go from a nation that extolled the sanctity of life to becoming a country that takes pride in butchering its own babies? How did we descend to the point where the active endorsement – or, at the very least, the benign acceptance — of the wholesale slaughter of the innocents is the singular qualification for occupying a position on the nation’s highest court? They bared their knuckles – and we bowed our heads. They became defiant – and we became compliant. Where were the evangelical leaders when Barack Obama stood up in front of a convention of zealous baby killers and uttered the absolutely obscenity, “God bless Planned Parenthood”? Where were we when George Bush hid in the White House instead of attending Right to Life marches? Where have we been? What have we done? Why has our side become increasingly silent – while their side has become egregiously strident? And how, then, can we possibly be surprised when they have successfully shifted the middle in their deadly direction by cynically exploiting their extreme, while we have supinely compromised ours – all in the hollow hope of establishing rapport with our sworn enemies? More than a century ago, the great British statesman Edmund Burke wrote, “All that is necessary for the triumph of evil is for good men to remain silent and do nothing.” Decades ago, Martin Luther King wrote, “I have not been hurt nearly so much by the words of my enemies as I have the silence of my friends.” Put less poetically, when someone is beating the pulp out of you, playing pattycake is not a viable alternative. So, here is the unvarnished truth: In the abortion battle – and in every single battle we now face with the far left – it is time for us conservatives to once again start taking the point. To begin anew fighting fire with fire… To adamantly demand that they end their cruel and callous assault upon our traditional values… To recall the words of Barry Goldwater: “Moderation in the protection of liberty is no virtue; extremism in the defense of freedom is no vice.” And to, frankly, follow the lead of Donald Trump. If we do not, then one day soon, the left’s entire extreme agenda will be stare decisis de facto in every area of our lives. And the “middle” ground in the land we love will devolve ineluctably into an unrecognizable wasteland of depravity, debauchery, and utter, abject deprivation. And that is not what we have in mind for our children, is it? Diogenes is the nom de guerre of a highly-placed Washington political operative who dares to tell the unvarnished truth.